Southern Area Cruiserweight Champion Leon ‘Solid’ Williams has signed a promotional contract with Frank Maloney. ‘Solid’ also secured his first fight, at the Brentwood Leisure Centre on the 5th February, under the Frank Maloney banner. 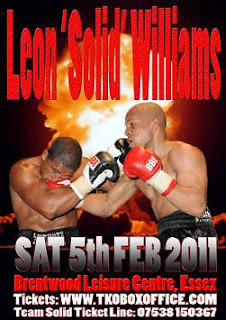 27 year old Leon, ranked #6 in Britain by BoxRec, is one of the Cruiserweight division’s rising stars. He won the BBBofC Southern Area title back in October ‘10 with a virtual lockout points victory over former Southern Area Light Heavyweight champion JJ Ojuederie. Leon dominated the proceedings throughout, forcing the normally stand up JJ to play it safe and stay out of trouble for almost the whole fight. It was the final round before JJ decided to stand his ground and trade punches with Leon. By then Leon’s aggressive all action approach had already earned him the belt, as was shown when Referee Jeff Hinds score card was read out - a decisive 99-92 points victory for Streatham’s favourite fighter. Following a training session, under the watchful eyes of his coach Johnny Eames at the Ultrachem TKO Gym in Canning Town, Leon spoke briefly on his signing with Frank Maloney. “Finally I’m with a big promoter, I’ve signed with Frank Maloney and I’ve got a great deal. I’ve been boxing small hall shows for a while, which has been fantastic, but I’ve wanted to fight on a bigger stage and for a promoter that has TV, hence Frank Maloney. It’s great, fantastic. All I’ve got to do is win and look good for a few fights and then Frank says he’ll push me for the British title later this year. I’ll be out for the first time under the Frank Maloney banner on the 5th February at the Brentwood Leisure Centre on the undercard of Jason Booth and Jamie Arthur’s Commonwealth title fight. It’s a great stage for my ‘debut’ for Frank Maloney so I’m very excited. I’ll get all my Team Solid supporters up there. It’s gonna be good. 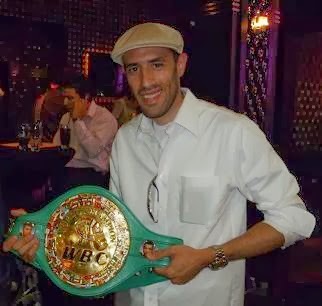 I’ve got a new promoter just weeks after signing with Johnny Eames as my trainer. Since I’ve been at the TKO Gym it’s just been fantastic. It’s the best gym. There’s a lot of big boys here so I’ve been getting a lot of sparring, so I’m really happy about that. There’s people here with fast hands, there’s punchers. I have to work to deal with them. It’s great I’m learning every time I’m here. Leon ‘Solid’ Williams, against a yet to be named opponent will feature on the undercard of the Frank Maloney promoted Jamie Arthur vs Jason Booth Commonwealth Super Bantamweight title clash at the Brentwood Leisure Centre, Brentwood, Essex on Saturday 5th February 2011. Commonwealth Gold and Olympic Bronze medalist David Price and exciting Light Middleweight prospect Erick ‘The Eagle’ Ochieng are also featured, against yet to be named opposition.